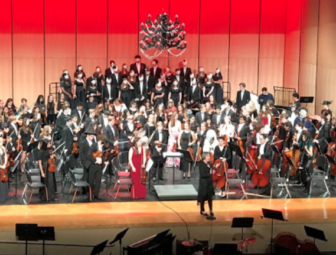 Darien High School music students will perform a special Holiday Spectrum Concert in the High School auditorium at 7 p.m. on Wednesday, Dec. 12, 2018. Darien senior citizens are invited to attend this concert free of charge and listen to the sounds of festive holiday music. The concert will feature the talented Darien High School band, orchestra, jazz ensemble, pop strings, concert choir and the Tudor Singers. A high school concert on Oct. 30, 2018. “We are delighted that Darien High School is sharing this opportunity with seniors in town,” remarked Gina Blum, executive director of At Home In Darien. Using volunteer drivers in conjunction with their professional drivers, At Home In Darien has arranged for free transportation for seniors. Any senior who is interested in attending the Holiday Spectrum Concert and would like a ride, please call At Home In Darien at 203.655.2227.